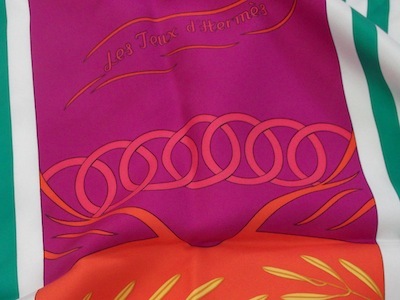 As many of you may know already, the Hermès theme for 2013 is sports/athletic competitions. 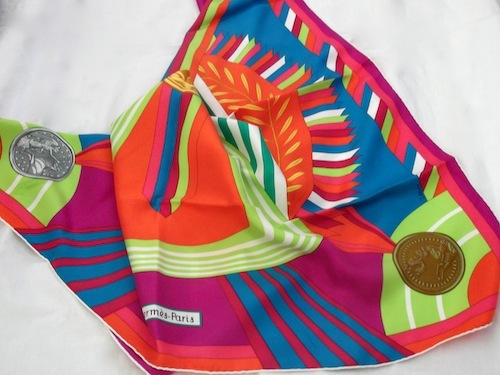 'Les Jeux d'Hermès' is one of the new 90 carré designs of the SS2013 collection, of which a limited number and colors have been pre-released for the 2012 Olympic Games in London. Caroline is one of the lucky few who already own this scarf, and so generously sent me her pictures to share with you. 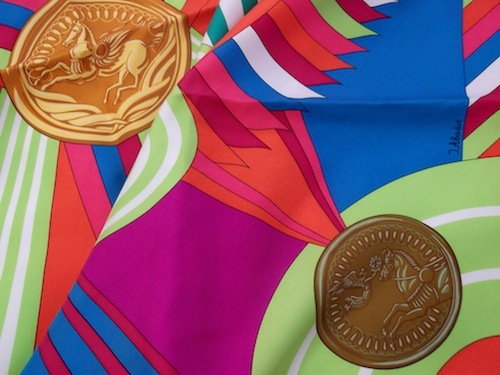 The design called 'Jeux de Hermes' and is based on the traditional symbols of the Olympic Games....You can see the medals, laurel wreath, olympic rings and running track are represented in typical Hermes style. 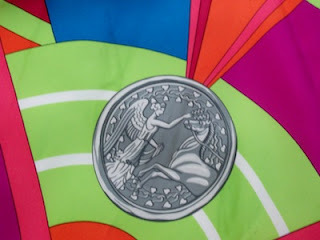 I was lucky enough to spend time in London this summer for the 2012 Olympic Games. 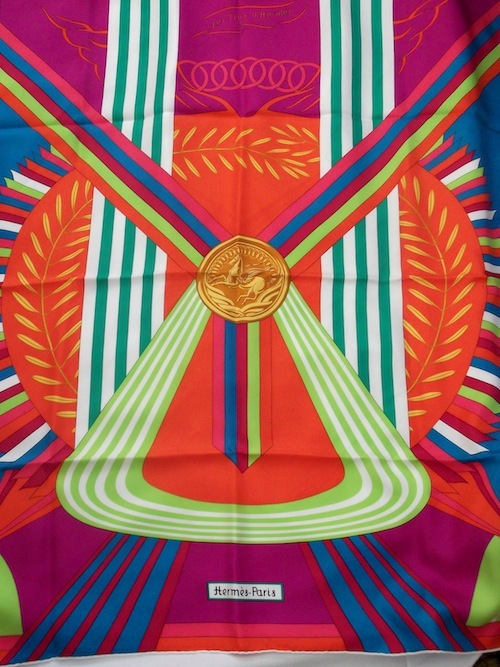 This scarf was on display, although sold out, in Harrods. 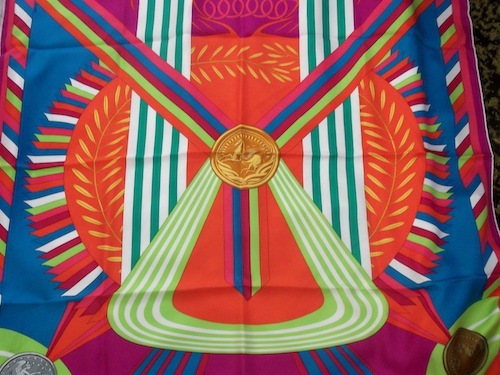 The staff explained that is was a scarf from SS2013 but Hermes had agreed to release a few in various colours for London to coincide with the games. Thanks to their help I was able to get the last scarf from the Sloane Street store and I absolutely love it. It is neither my normal choice of pattern or colour but somehow it works and I've had many compliments. It's been a treat to wear something so exclusive for the past few months before it becomes available to everyone. 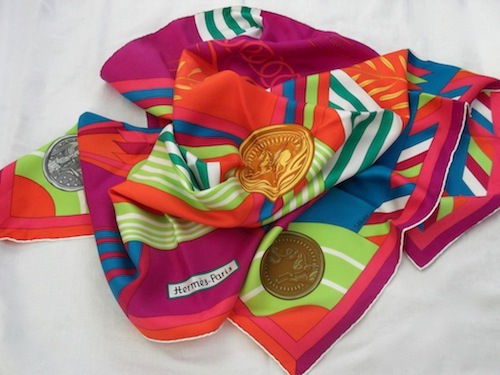 Even though there is no mention on the scarf itself of London 2012 I know it's a souvenir of a wonderful exciting time at the Olympic Games. 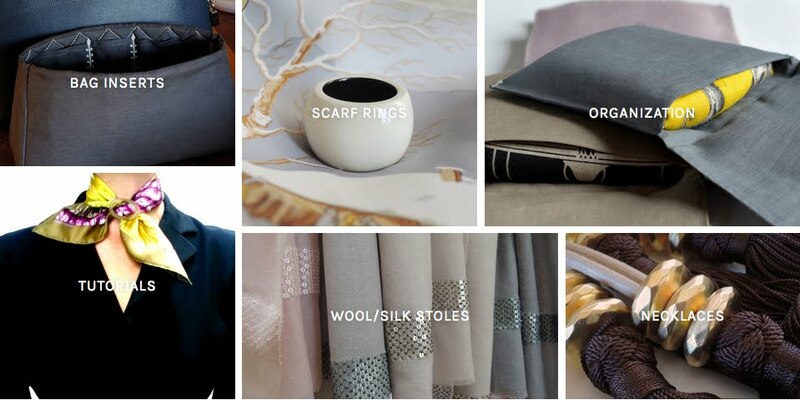 If you think it may also be of interest to your blog readers then feel free to share. I do enjoy reading your blog by the way, keep up the good work! Many thanks for so generously sharing with us, dear Caroline! Thank you to you dearest MaiTai and to Caroline for sharing. Wishing you a lovely weekend and sending you Christmas hugs, M.